The right-leaning journalist made sure his scathing documentary pulled no punches. That wouldn’t happen, he says, if “Hoaxed” portrayed him as a victim. As is, “Hoaxed” captures a media landscape in disarray. Cernovich had hoped to release “Hoaxed” just before the 2018 mid-term elections. The film hit some bureaucratic snags, missing that window. A recent flurry of Fake news proved too much to resist. Last month, the media committed one of its most glaring gaffes, even by its own dubious standards. Reporters rushed to depict a 16-year-old Catholic school student as a racist, privileged, Trump-loving monster for insulting a Native American elder. “We got lucky,” he says. “When CovingtonGate happened [we said] we’ve just gotta get [‘Hoaxed’] out.” Audiences can sample the film now for $4.99 on Vimeo.com. Cernovich vows a theatrical release is in the works, too. FAST FACT: Mike Cernovich brought old, disturbing Tweets by ‘Guardians of the Galaxy’ director James Gunn back to the surface last year, leading to Gunn’s dismissal from the MCU franchise. “Hoaxed” features rising cultural stars like “Dilbert” creator Scott Adams and Canadian clinical psychologist Jordan Peterson, familiar faces to Red State viewers. Cernovich’s team also showcases Hawk Newsome, part of the Black Lives Matter movement. The filmmaker reached out to several “lefty” journalists, offering them 90 seconds of air time with full creative control. Cernovich’s film finds InfoWars personality Alex Jones weighing in on Fake News and media bias. It’s an odd choice, to be kind, given Jones’ history of outlandish comments. The most glaring remains his theory that the Sandy Hook Elementary School shooting, which left 28 people dead (mostly children), never happened. The event was staged to help push the gun control agenda, he suggested. Several Sandy Hook parents filed suit against him on defamation charges. “He apologized for all of that,” Cernovich says. He adds that Jones, for all his flaws, is often ahead of the media curve. For example, Jones warned the devices spying on us, a conspiracy that sounds more plausible given the rise of Alexa-style devices and Facebook shenanigans. 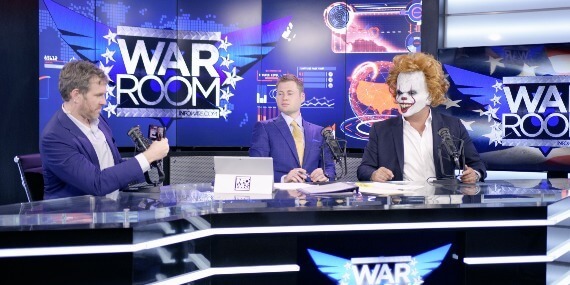 Mike Cernovich, left, takes part in an InfoWars broadcast with a masked Alex Jones. Cernovich understands why Jones remains a juicy target for media attacks. 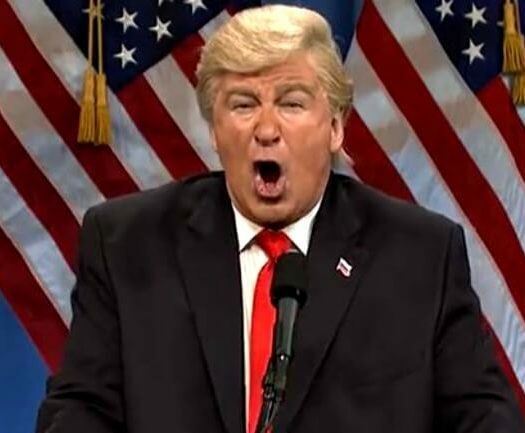 His theatrical shtick invites critics, even before they consider his commentary. It’s a tactic Cernovich has personally advised him against. The media attacks on Jones, including deplatforming efforts, are part of a larger pattern, Cernovich warns. Make a mistake, like his intital flirtation with the infamous PizzaGate conspiracy, and suddenly it trails you in every media mention. “Mike Cernovich, comma, and then we tell you ten things about him that are evil, comma,” he explains. He says the tactic works in one direction. “If you’re a [mainstream media] journalist and you blow a major story, they don’t mention it again and again,” he says. For example, CNN’s Kaitlan Collins got called out for using gay slurs on social media several years back, but the news cycle quickly moved on. That incident isn’t repeated whenever her name appears in news stories. “It’s a glaring, glaring double standard,” he says. Check out yours truly and @TrueLegendFilms discussing #HOAXED. “Hoaxed” leans heavily on new media journalists, like left-leaning Tim Pool. His sequence finds him investigating “no go” zones in Sweden, armed with a GoPro-style camera. These neighborhoods are allegedly overrun by violent immigrants. Local law enforcement, and EMTs, often refuse to enter them. Pool’s chilling footage shows him being not so gently escorted out of such a space by Swedish police. Then we see Swedish news reports denying what we just saw. “Facts persuade,” Cernovich says, quoting Breitbart. Cernovich doesn’t leave the self-criticism to “Hoaxed” alone. “I took the character I was playing a little too far,” he says of his earlier journalistic style. “I’m dealing with the consequences of that to this day.” He understands that public style of healing won’t happen overnight. “You need to show people years’ worth of good behavior,” he says.